Day #4: Tell us about a weird food combo that you love. Once, when I was young, my mom told me that when she was young, her older sister used to eat the weirdest food combination: shortening plus granulated sugar. Basically, fat and sugar. My mom told me this in disgust, and on the surface I sympathized, but inside I was curious: What would shortening and sugar taste like? Needless to say, I found out: Sickeningly oily, sweet, and a teeny tiny bit disgustingly good. Unlike my aunt, I never made a habit of sneaking the infamous shortening-sugar mixture. But, I must admit, I do have a snack habit that’s nearly as weird. These days, when I get the munchies, here’s what I mix up. IT’S WEIRD AND GROSS AND UNHEALTHY, I KNOW. It’s a sugar and fat bomb. But it’s MY sugar and fat bomb. 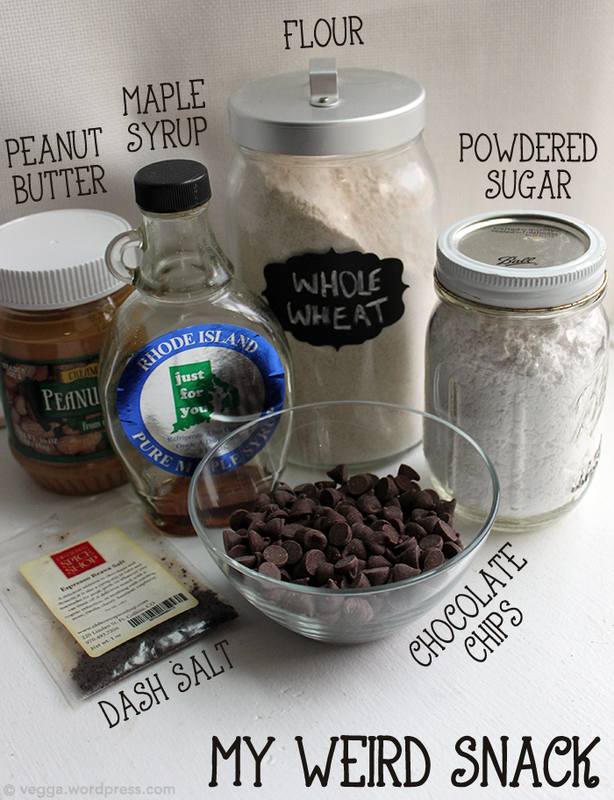 I mix up a big spoonful of peanut butter, a small scoop of flour, a small glug of maple syrup, a dash salt, a handful of chocolate chips, and enough powdered sugar to make into a goopier cookie dough texture. And then I eat it. And now that’s out in the open. …so, what’s YOUR weird snack?! It is! It’s so good, especially in something like brownies. Baking soda is such a great idea. it’s like a version of instant cookie dough! I think it sounds great. When I was little, I used to sneak giant patties of butter and eat them straight… so I guess I got your mom’s sister beat, because I didn’t even bother with the sugar. The thought of it now is practically enough to make me feel sick! ha ha. Also, I am so curious about that espresso bean salt. I mean, what the what? It sounds amazing. I love this salt! It’s so great in brownies. And eating butter plain… yeah, you win! This sounds similar to something me and my sister made, we’d melt butter in the microwave and mix in flour, sugar and cocoa powder, I guess like a warm chocolate cake batter! It was gooood.